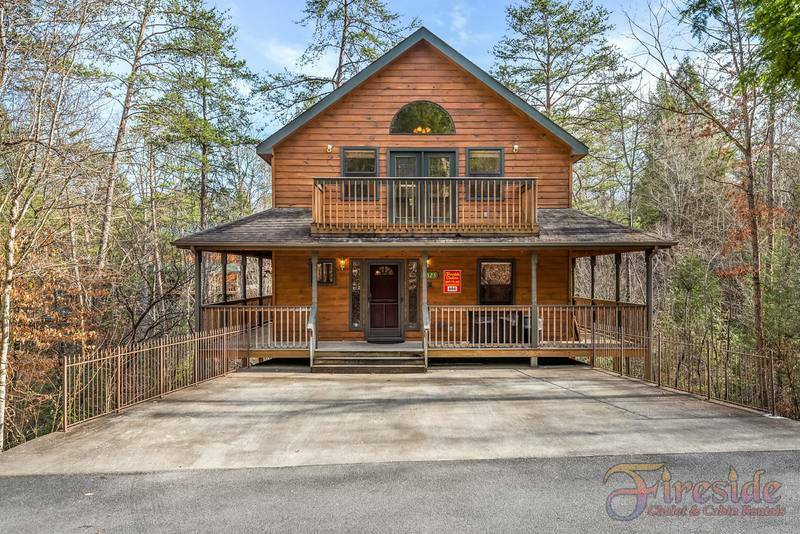 Pigeon Forge Chalet "Best Time Ever" Unit 808: Enjoy your Smoky Mountain Vacation in this beautiful 5 bedroom, 3 bath home nestled in a wooded resort with access to a seasonal outdoor swimming pool, basketball court and just minutes from the Shows and Restaurants in Pigeon Forge and Gatlinburg. 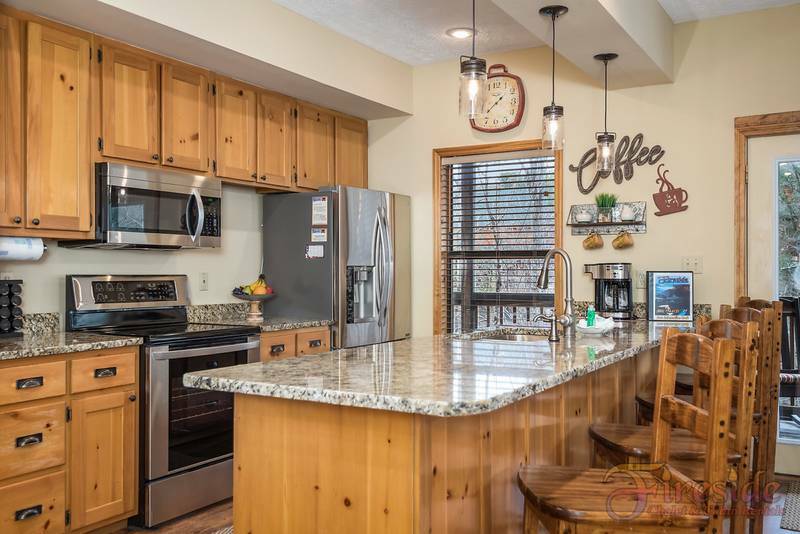 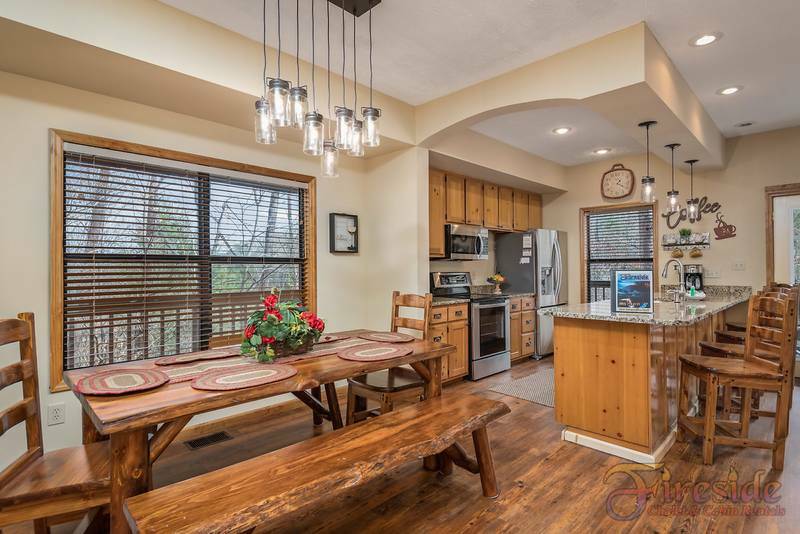 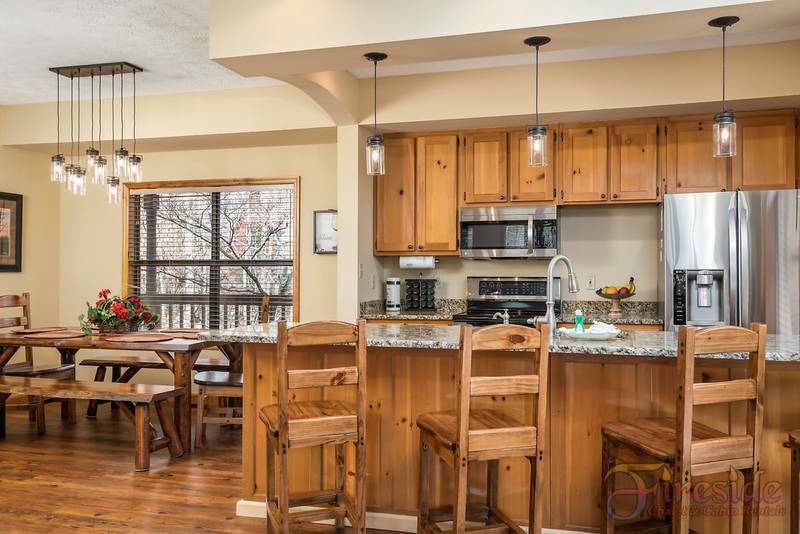 The spacious kitchen with granite counter tops comes fully equipped with stainless steel appliances including refrigerator, dishwasher, oven, microwave and coffee pot. 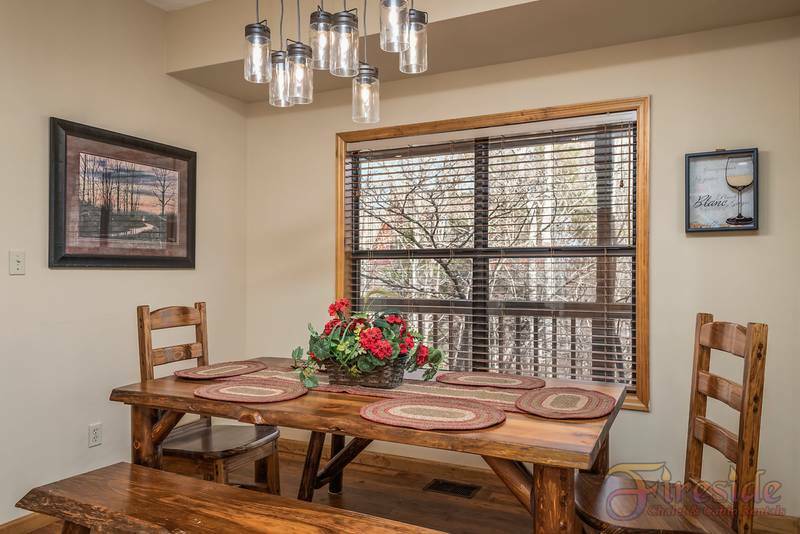 Enjoy your meals at the picnic style dining table with seating for up to 8 people. 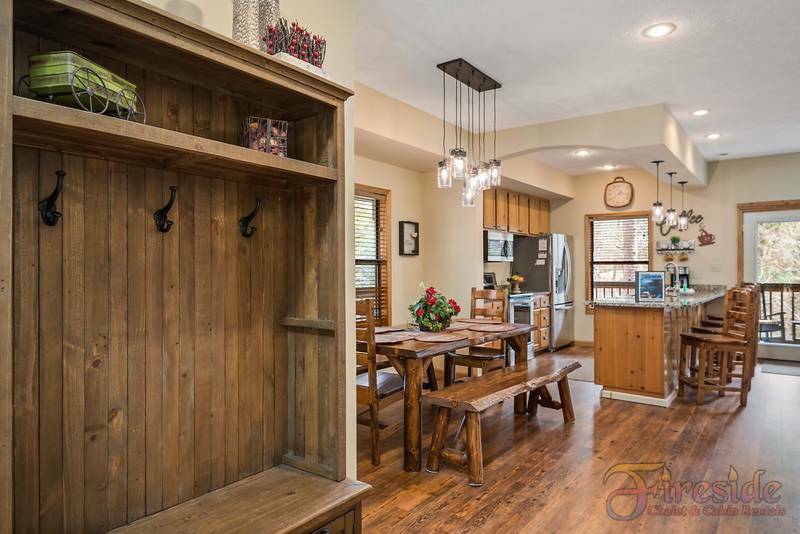 There is also seating for 4 at the counter. 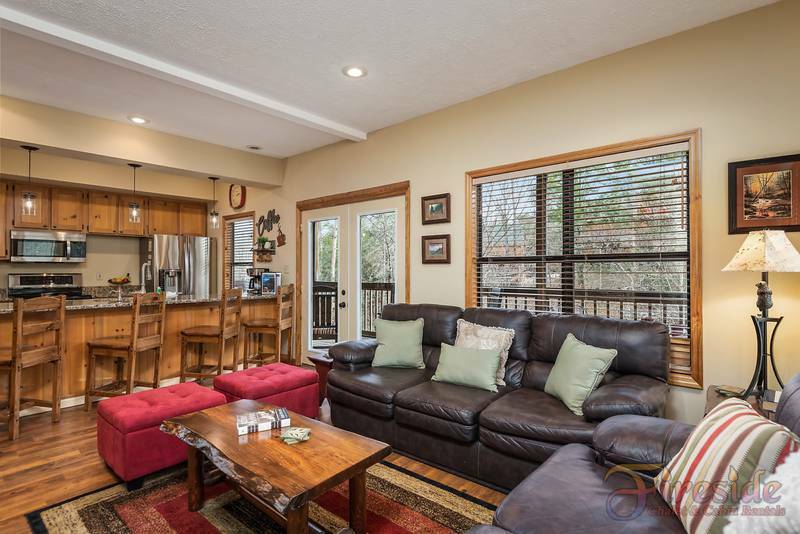 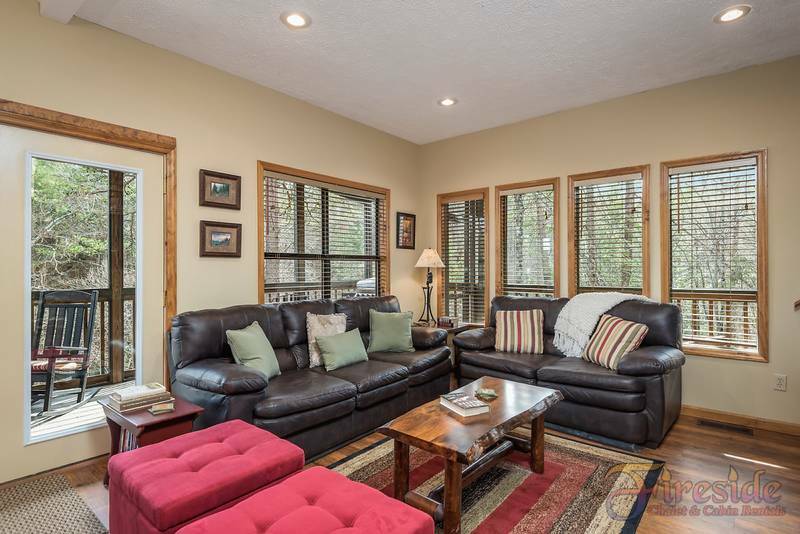 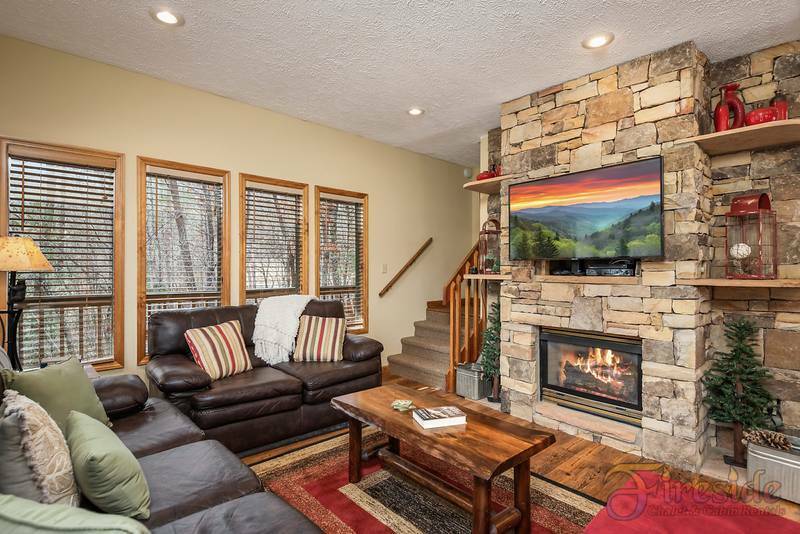 The living area has a cozy gas Fireplace with a 50 inch flat screen television with cable. 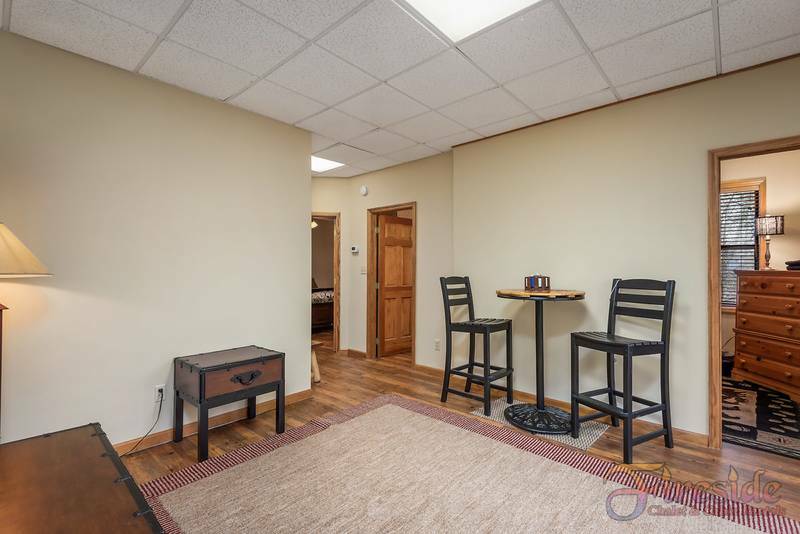 Take advantage of the library of movies that is provided for your convenience, or stay connected with the free wireless internet. 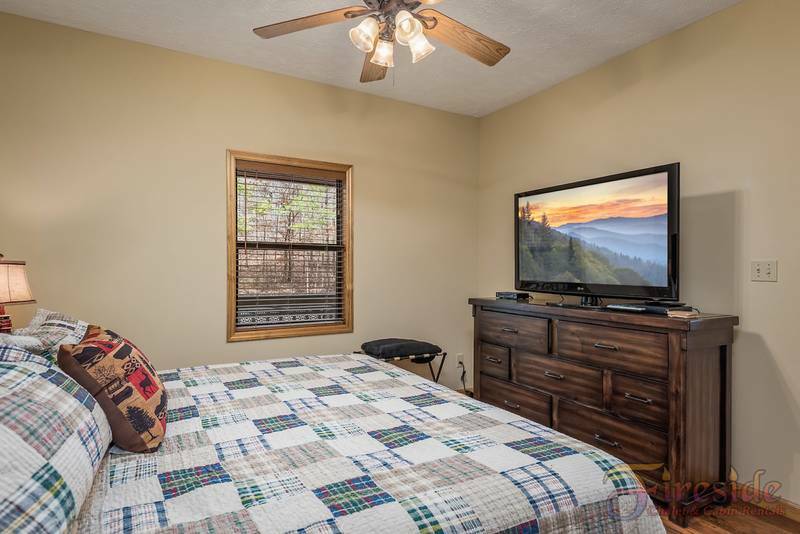 The main level also offers a bedroom with a King sized bed, 50 inch flat screen television with cable, and a separate bath with a tub/shower combo. 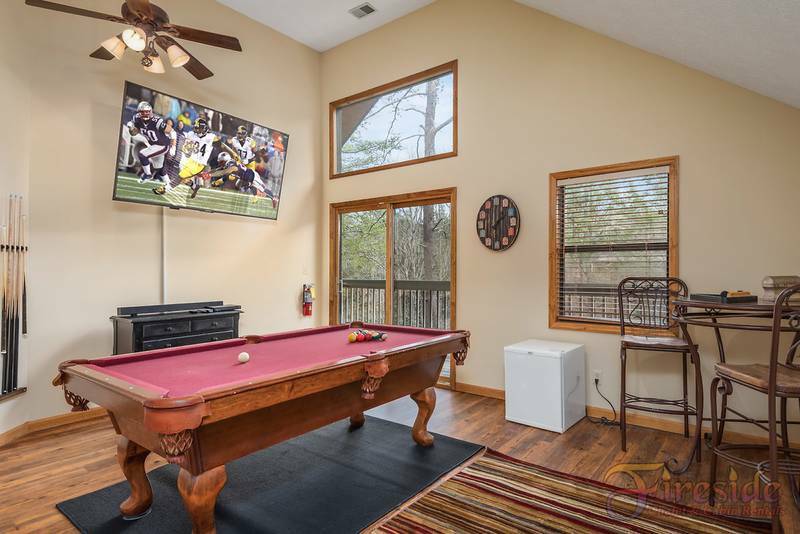 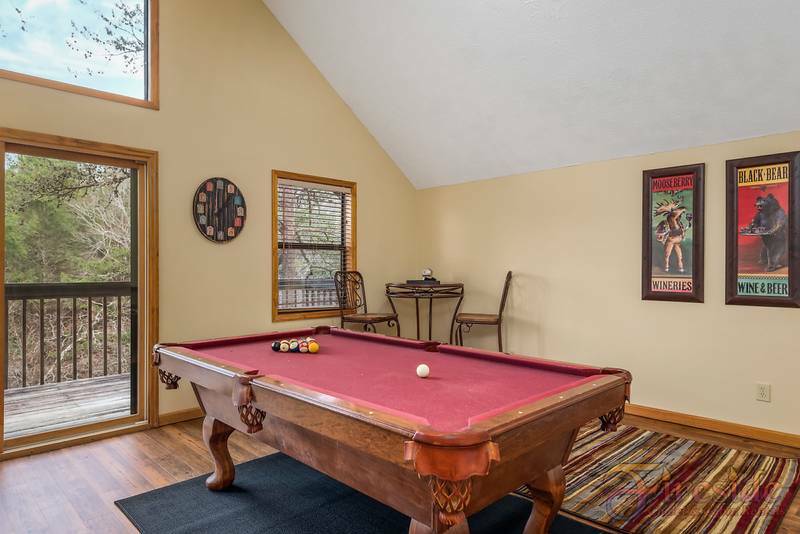 Upstairs, you will find a game room with pool table and 75 inch flat screen television, mini fridge, and CD player. 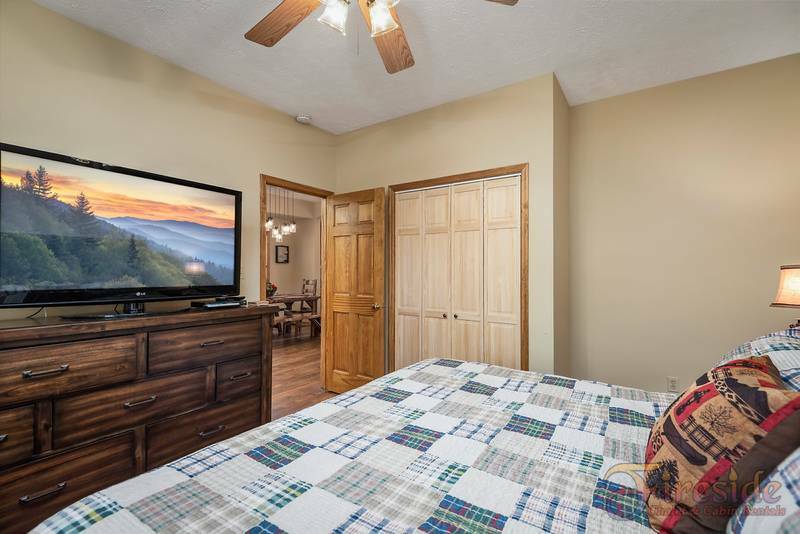 The Master suite upstairs has a king sized bed, 55 inch flat screen television with cable, and entrance to a private balcony. 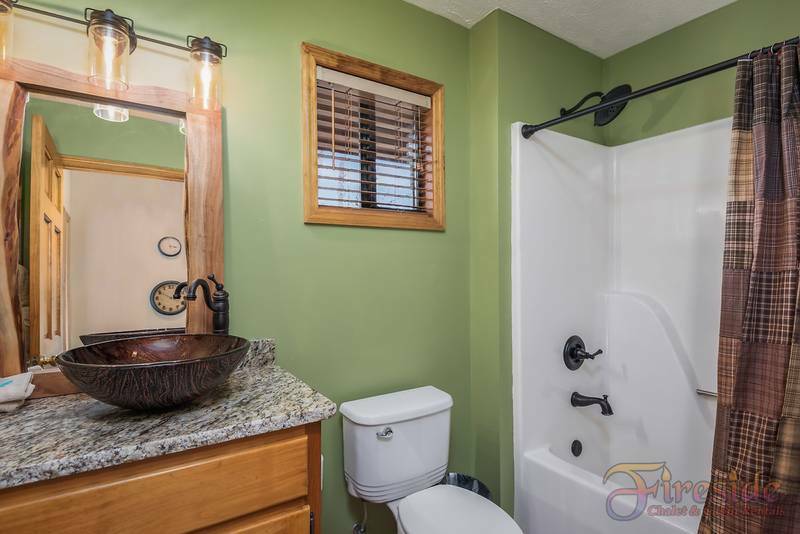 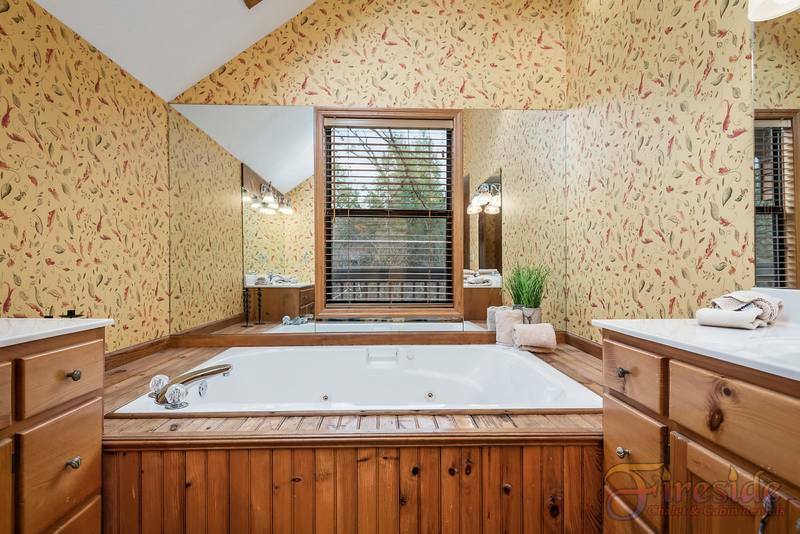 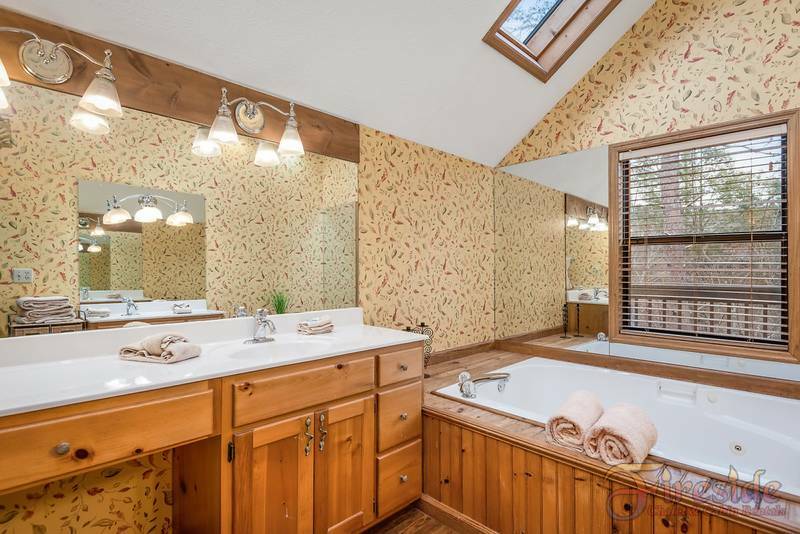 The adjoining bath has a tub shower combo, or you can relax under the skylight while soaking in the whirlpool tub. 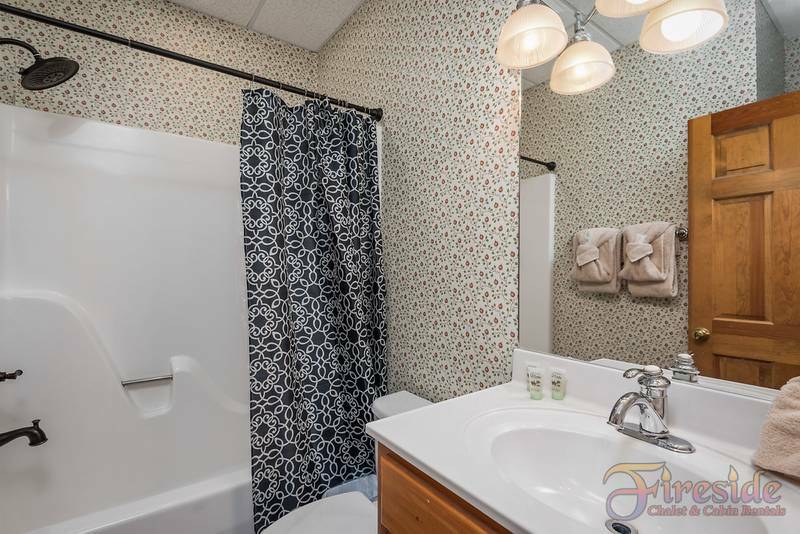 There is a laundry room as well complete with full size washer and Dryer, a laundry sink and iron and ironing board. 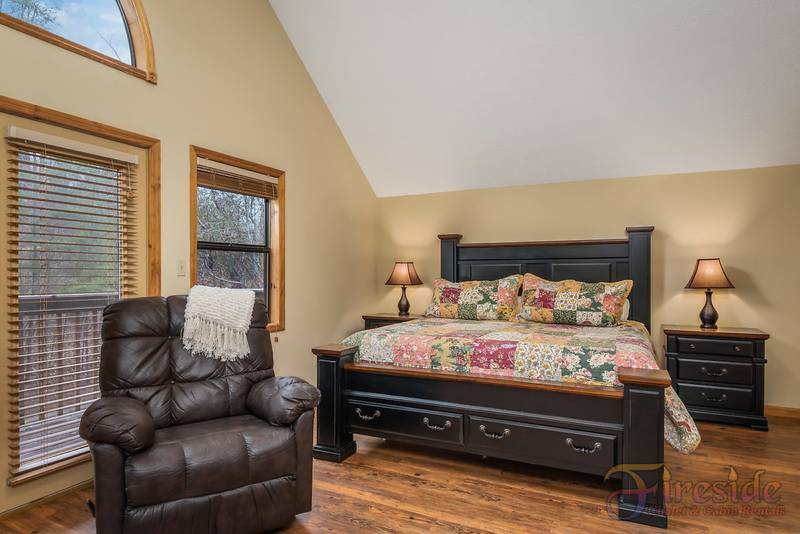 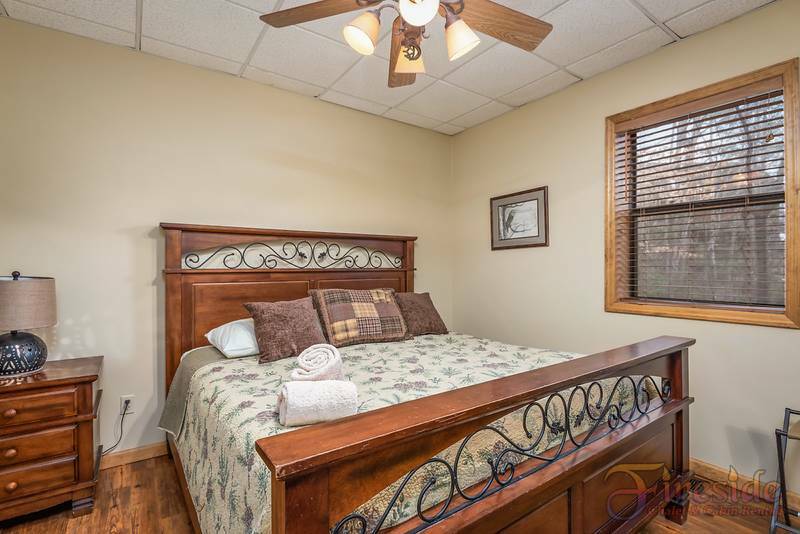 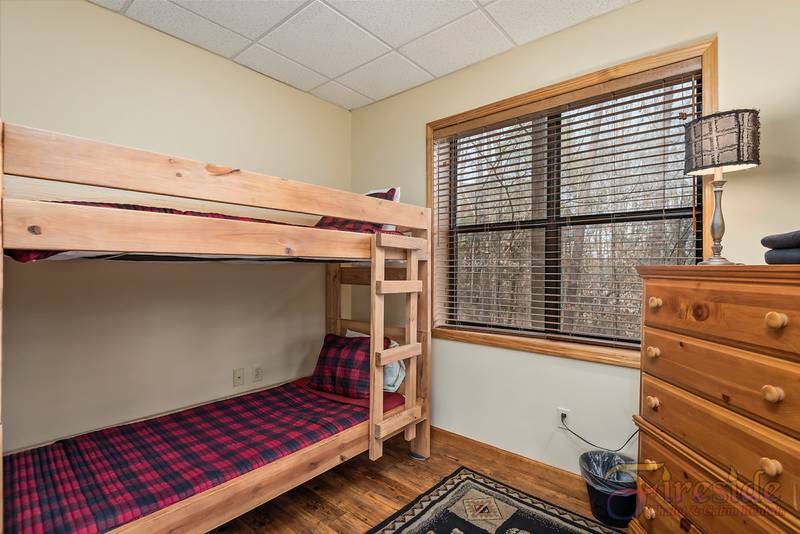 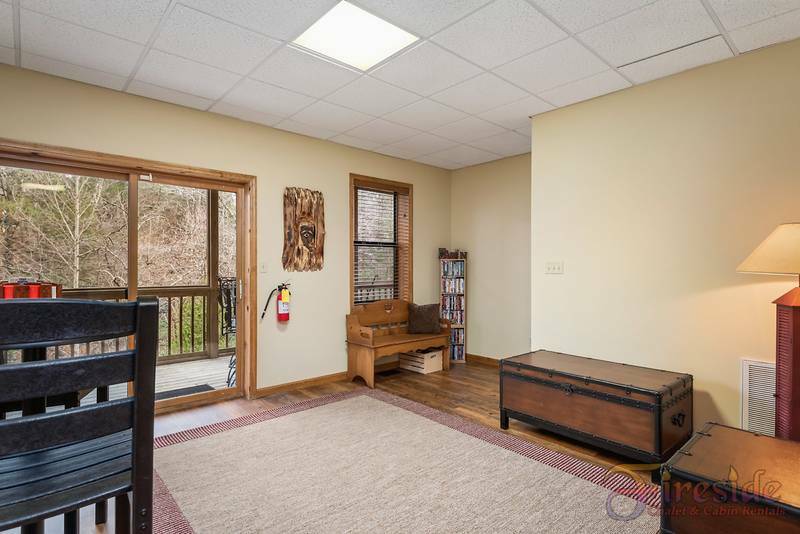 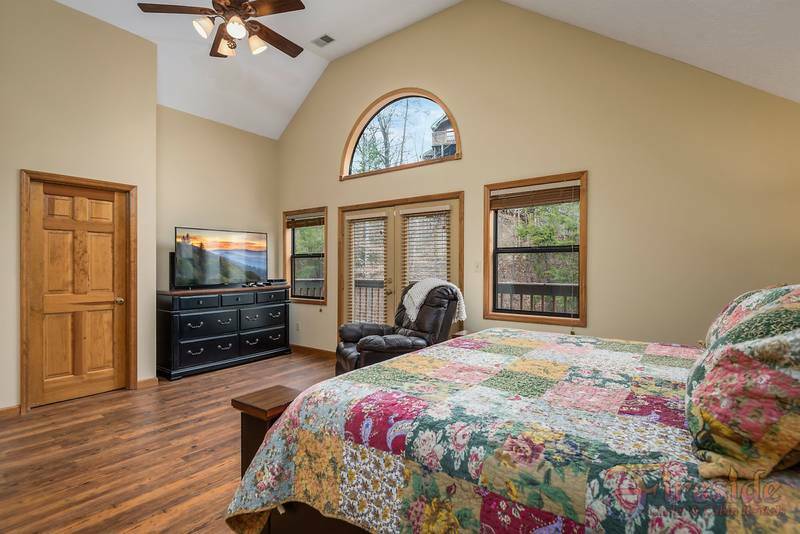 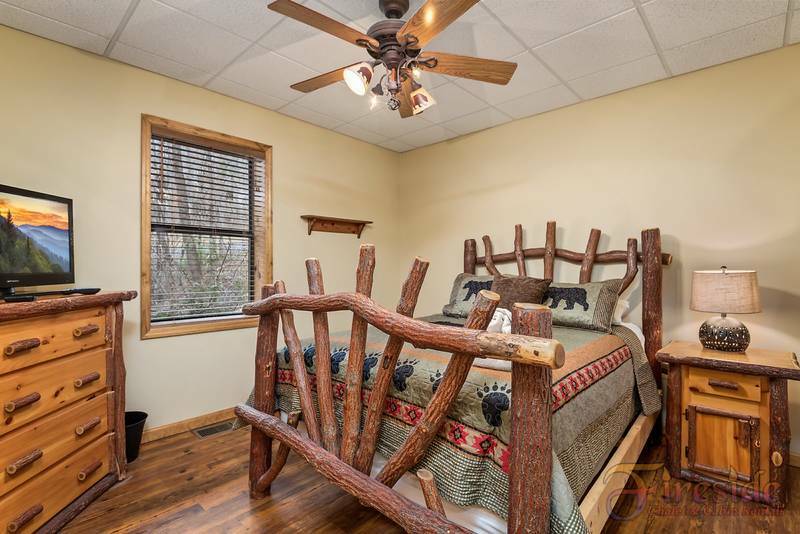 Downstairs, you will find a bedroom with a set of bunk beds, a second bedroom with a full sized bed and 32 inch flat screen television with DVD player only, and a third bedroom with a king sized bed and 32 inch flat screen television with Roku access only. 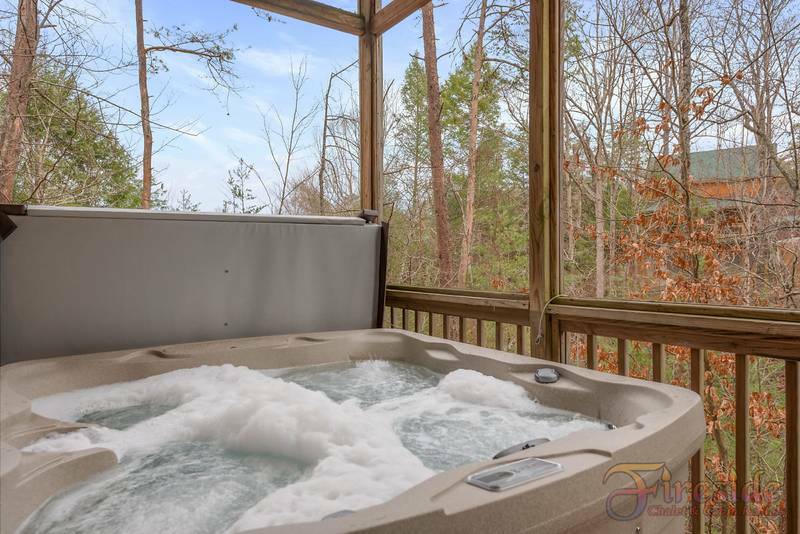 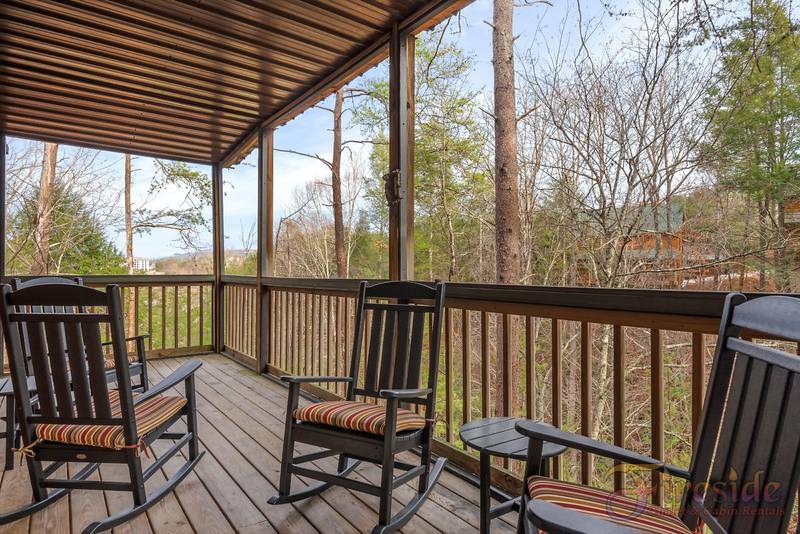 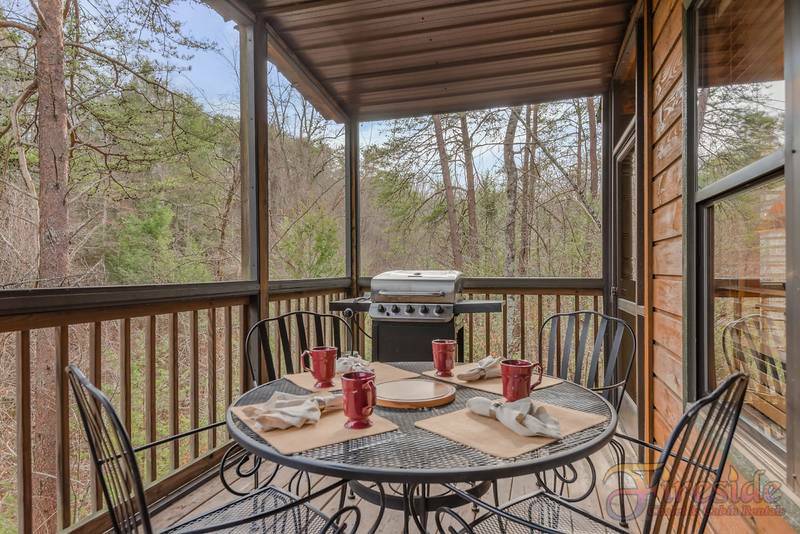 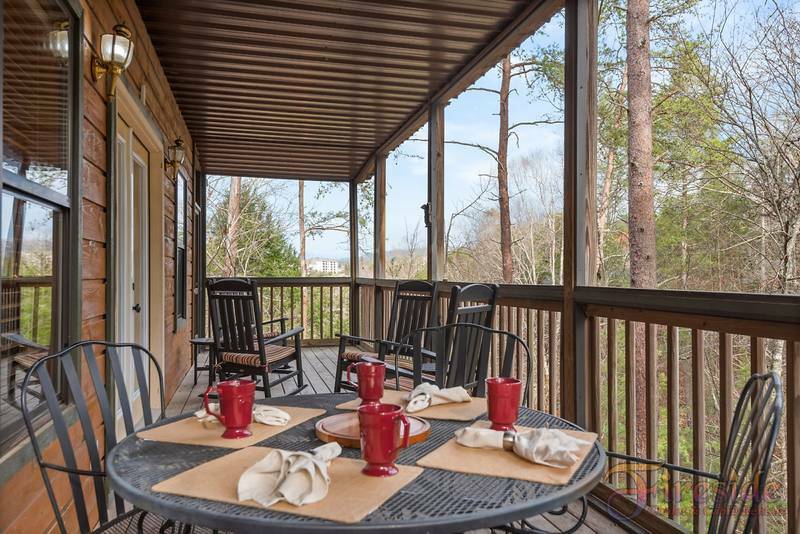 Relax with your loved ones as you soak in the hot tub or gather together on the porch for a cookout on the gas grill. 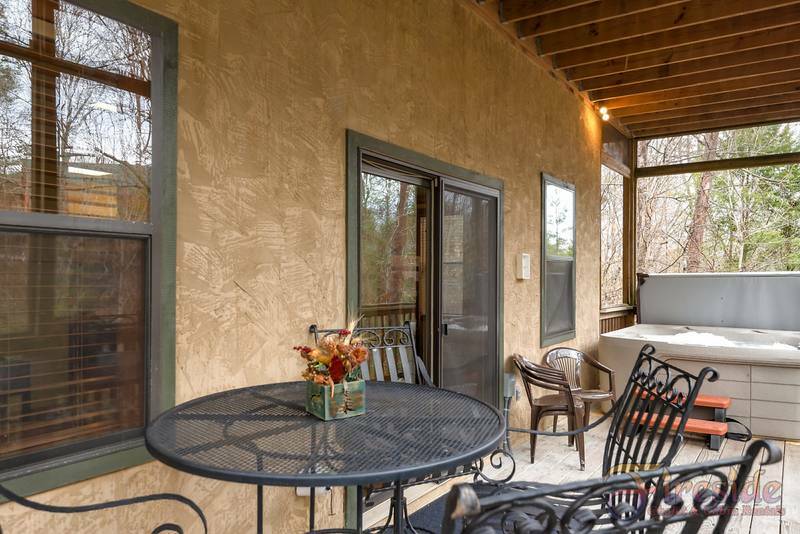 Just when you think you have seen it all you go out on the covered porch for a game of putt putt. 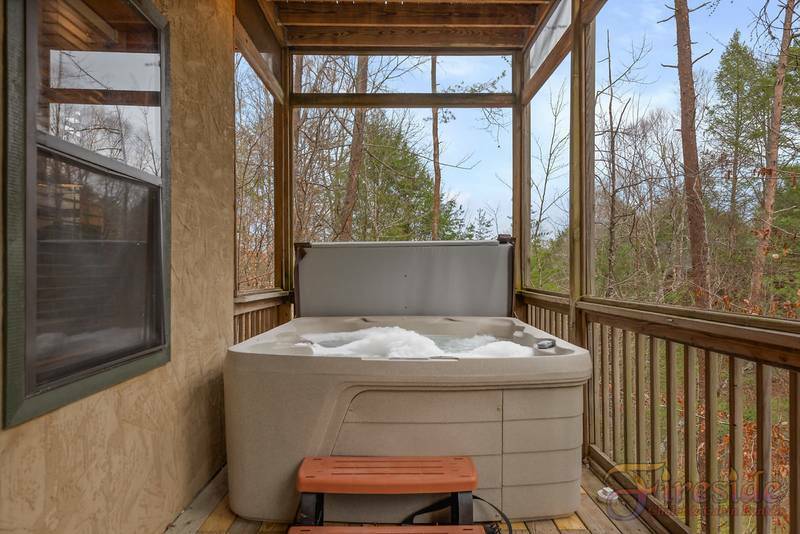 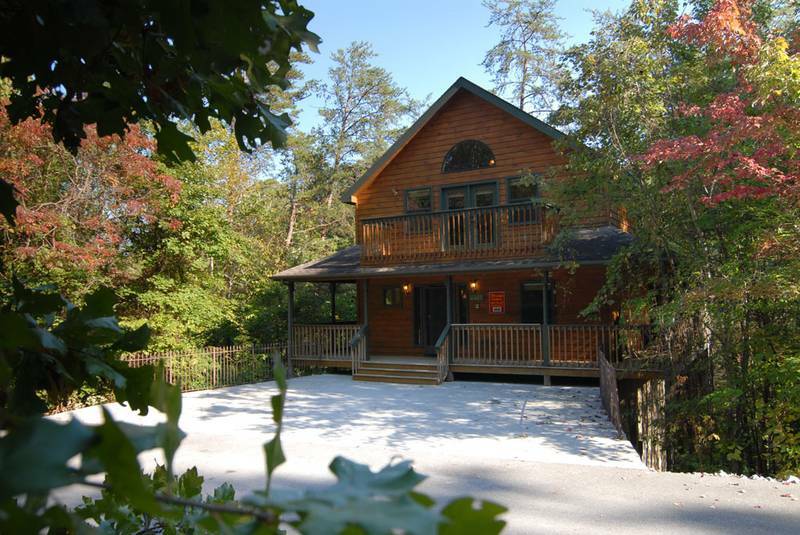 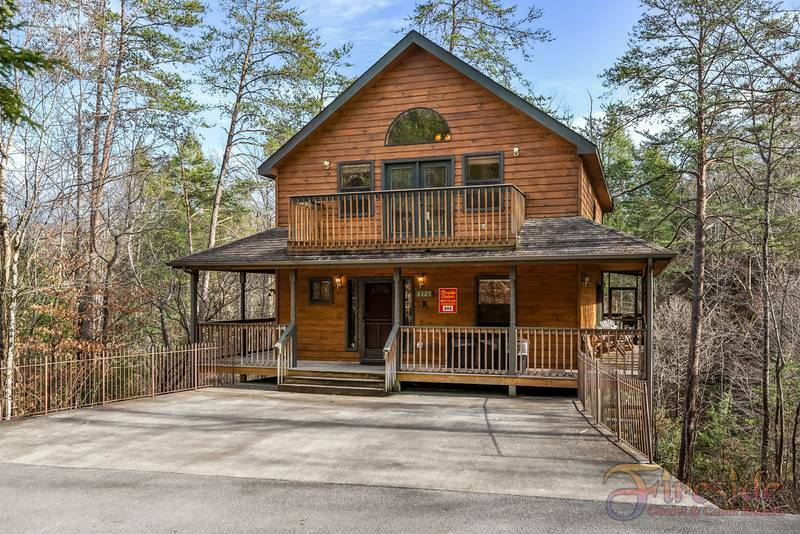 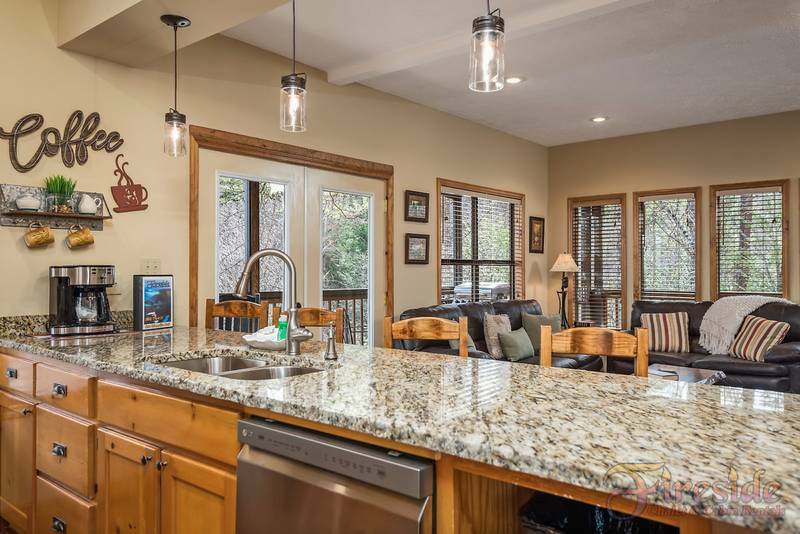 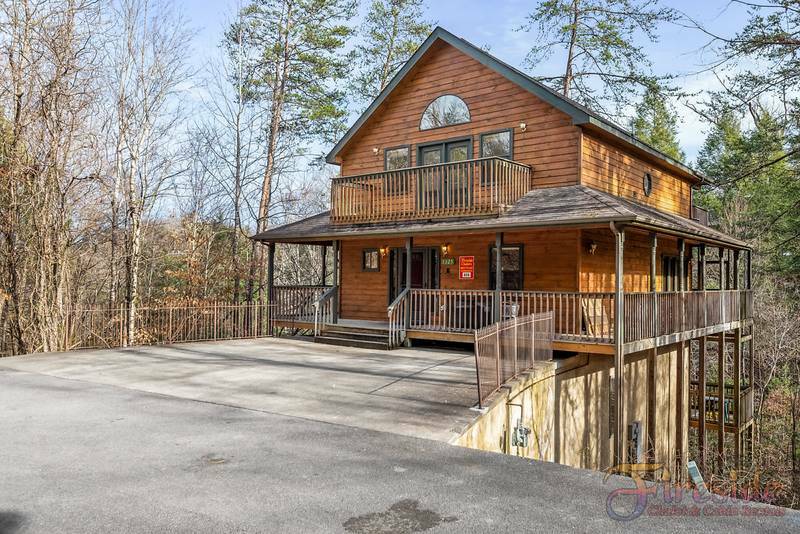 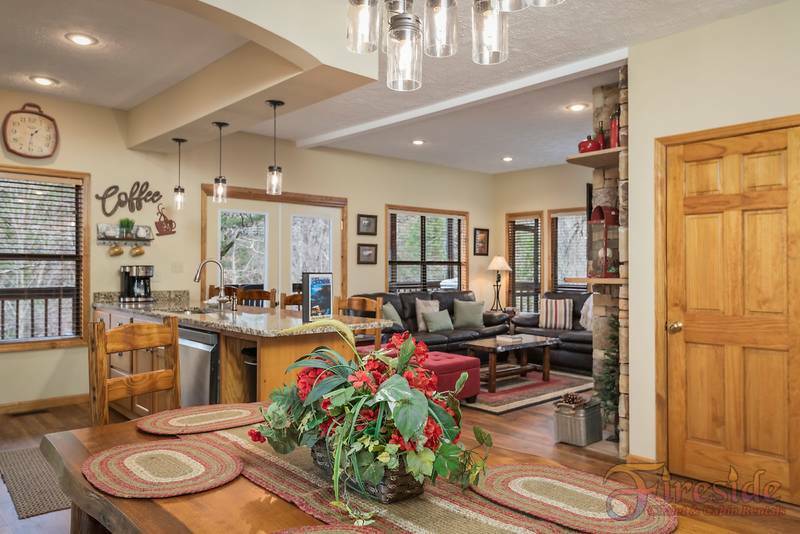 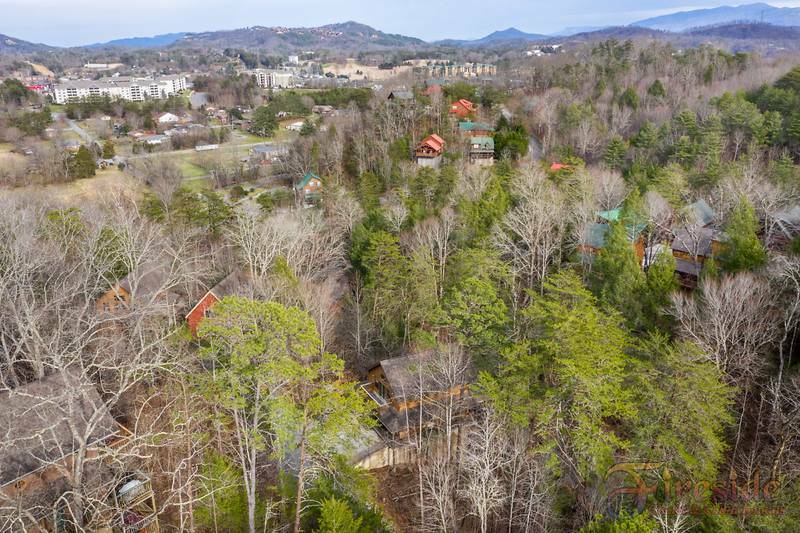 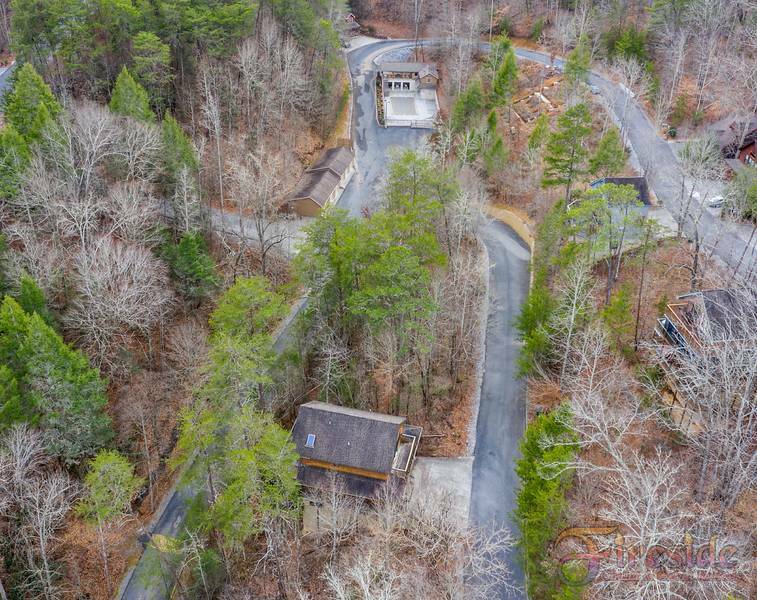 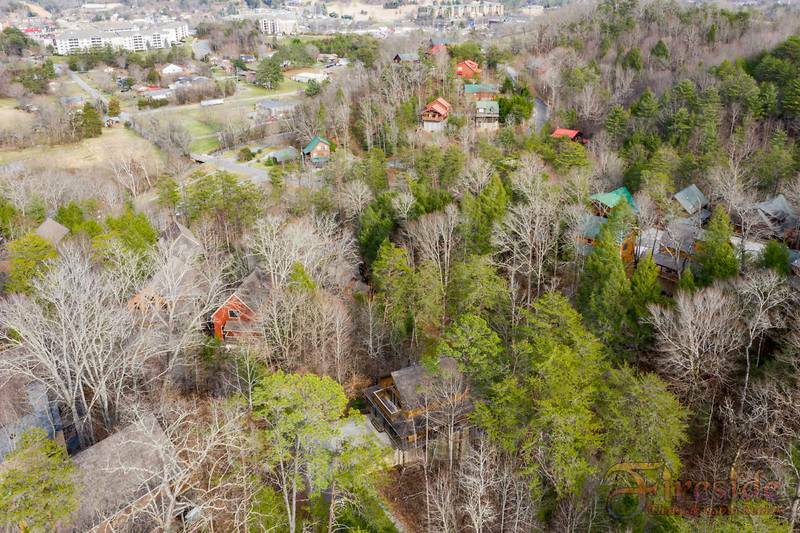 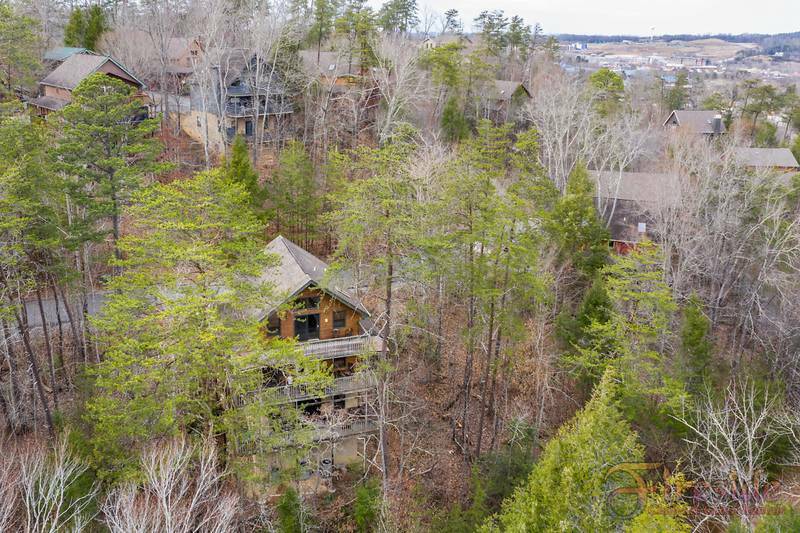 This cabin has all the amenities you will need to have a vacation you will never forget. 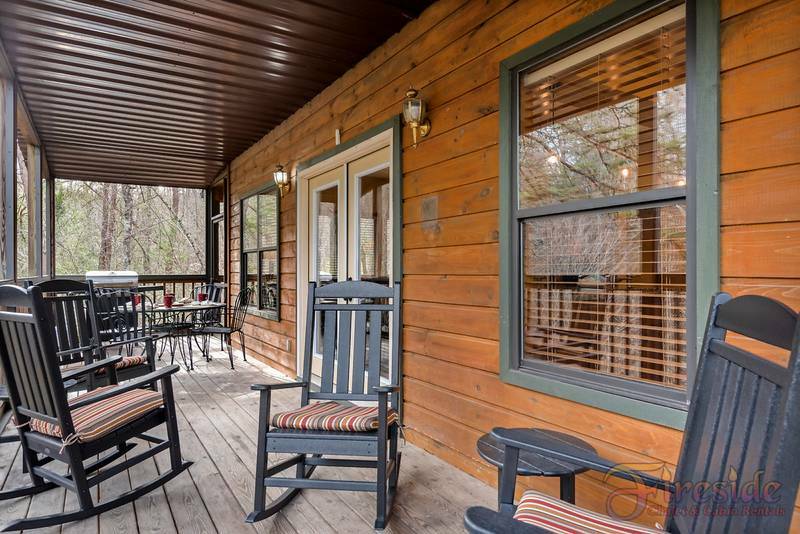 This cabin is non smoking, no pets please, sleeps 10.